I'm not going to go so far as to say that The Fault in Our Stars is the kind of book that all living humans need to read, nor will I argue that it is perfect. But I will say it is the kind of book that shatters the world in a way that makes it feel like all of the pieces might not ever go back together perfectly, like everything is slightly askew after you rebuild it. The Fault in Our Stars is, at its heart, a love story. 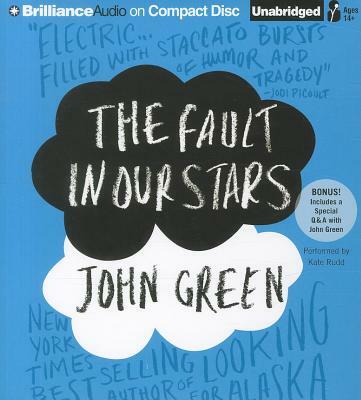 A girl named Hazel Grace meets a boy named Augustus at a teenage cancer support group. He likes her because she looks like his dead ex-girlfriend, but then because she is kind and smart and funny. She likes him because he is witty* and cute and makes her laugh. They fall in love. They go on adventures. They suffer through the pains of cancer together, her lugging an oxygen tank behind her wherever she goes, he limping around on a prosthetic after losing a leg to cancer. They ruminate on the meaning of life and death and experience. They help their friend Isaac get through the loss of an eye, his adjustment to life without sight, and his devastating break-up with his girlfriend. In short, except for the cancer, they are just two pretentious teenagers in love. But in their lives, there is no "except for the cancer." It is everything, it shapes everything, it controls everything. And so The Fault in Our Stars quickly becomes more than a teenage love story, morphing into a story of two people trying desperately to hold on to the world and to each other, to control their own destinies, to hold up in the face of pain, and trial, and loss. On audio, Kate Rudd's narration brings Hazel Grace's character to life more than I think might have happened in print, which makes her hardships only the more difficult to bear. But the narration (both Kate Rudd's voice and Hazel Grace's telling of her story) is not without a touch of hope, for where there is love, there is also happiness. Or something like that. Honestly, I was crying too much at the end to have many deep thoughts beyond how much heartbreak I could stand in one read. And I am not a big book-crier. The Fault in Our Stars has fallen victim to the hype machine, torn apart by those disappointed in it, elevated beyond reason by those who adore it. But if taken for what it is--a love story between two very sick teenagers--it defies expectations, proving to be bigger than any one descriptor. It will make you re-think what it is to be loved, to love, to be needed, to need, to be in pain, to be dying, to be lost, and to consider that life is just a sum of all the small moments we are given. *My biggest beef with this book was Augustus, because while I know he is meant to be a pretentious teenager, I just cannot believe there are teenagers who talk like that. At all. In fact, I don't even think there are adults who talk like Augustus. He's too smart, too philosophical, too perfectly quippy to be seventeen. But when I was able to gloss over this annoyance, I did sort of love Augustus, after all. "In short, except for the cancer, they are just two pretentious teenagers in love" haha yes to this. And I agree 100% with your Augustus complaints. I think they tainted the story more for me than they did for you though. That's fair. It was distracting for me at first, but after a while I was able to just take the story as it was without being too annoyed by Augustus' pretensions. I mean, I know he was *supposed* to be pretentious, but it just seemed a bit much. I still loved the book, though, pretensions and all. Yeah, I think John Green's characters' dialogue is largely unbelievable--but that doesn't mean I didn't LOVE this book to pieces. it was so good. SO good. Agreed! It says something about how good the rest of the book is, I think, that I could get past my hang-ups on the dialogue. Because MAN, it is good. >>>In short, except for the cancer, they are just two pretentious teenagers in love. But in their lives, there is no "except for the cancer." Love this. And also, I think there are teenagers that talk like Augustus. Maybe not exactly exactly, but there were a lot of suuuuuuper pretentious teenagers in my high school who at least talked sort of like Augustus. I've never read anything by John Green before but I kind of want to meet this god! I had no idea he was so popular! Wonderful review!